This will be the last official blog post of the 2016-2017 school year. We’ve enjoyed sharing news from throughout our District with you regularly throughout the school year. Blog posts will resume in early August to prepare for the start of the upcoming 2017-18 school year! The first day for students in the 2017-18 school year is Monday, Aug. 21st. To download a copy of the 2017-2018 school year calendar, please click HERE. Enjoy the rest of the long summer break! Parents needing to designate a single alternative pick-up/drop-off address for their students in the 2017-18 year must submit an Alternative Transportation Form by THIS THURSDAY, JUNE 15TH. Each year new forms are required even if your requested pick-up/drop-off site is the same. Please click HERE for additional information and to access Alternative Transportation Forms for the 2017-18 school year. 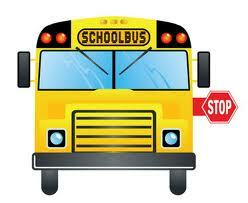 Please contact the Transportation Department at 427-6350 with any questions. OFHS students gathered in front of author Antoine St.-Exupery’s rowhouse. 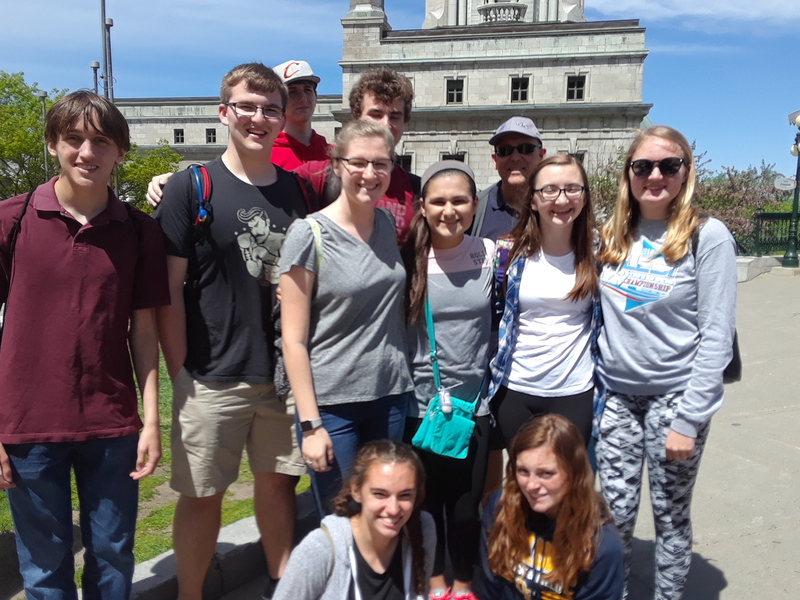 Twenty Bulldog students, who have completed their 2nd through 4th years of French studies at OFHS, traveled to Quebec City, Canada June 4-7 with French Teacher and French Club Advisor Mr. Chuck May. 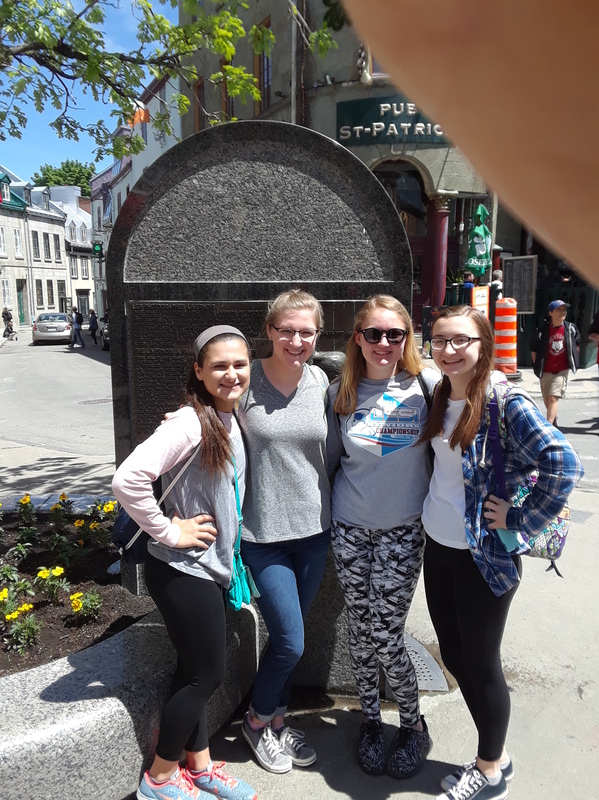 The tour of Quebec provided students many opportunities to use their French, learn about Quebec history, and experience, first-hand, Quebec culture and food. 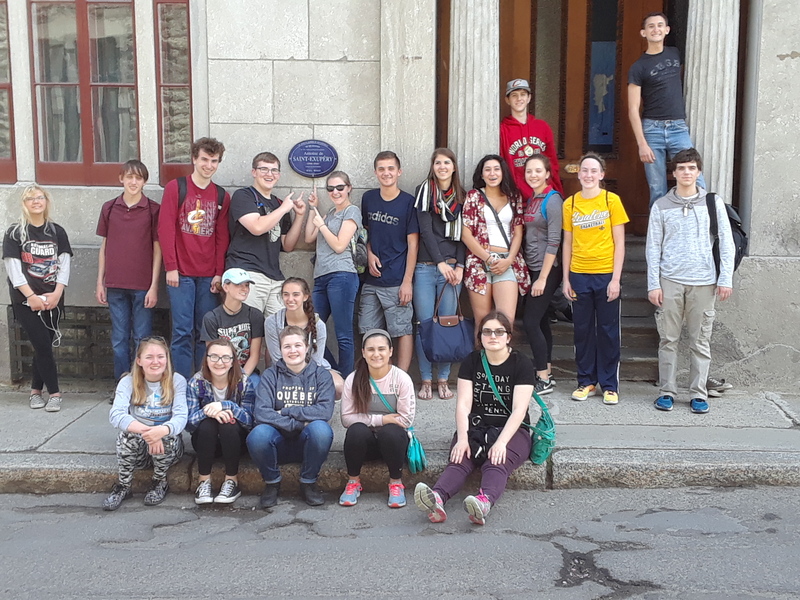 Students were particularly interested to visit the row house of author Antoine St.-Exupery, as all second-year students have read this author’s book, Le Petit Prince, as part of their coursework. All of the students had a wonderful time and vowed to return again! Bulldogs Lexy Jensen, Greg Smith, Lainey Rambert, Alexis Nelan and Megan Green pose for a photo at Severance Hall prior to performing with rock legend Melissa Etheridge and the Contemporary Youth Orchestra / Chorus on June 7th. 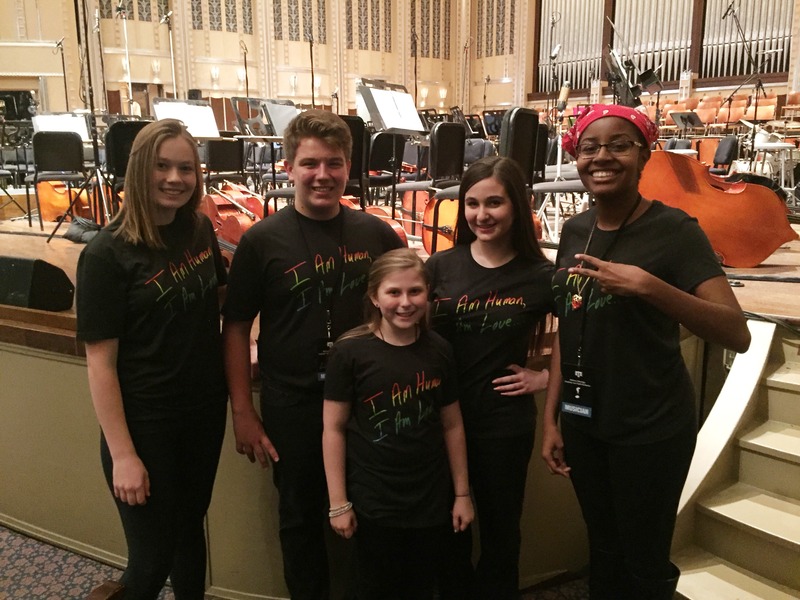 Five students from Olmsted Falls City Schools were members of the Contemporary Youth Orchestra and Chorus that performed with rock legend Melissa Etheridge at Severance Hall on Wednesday, June 7th. 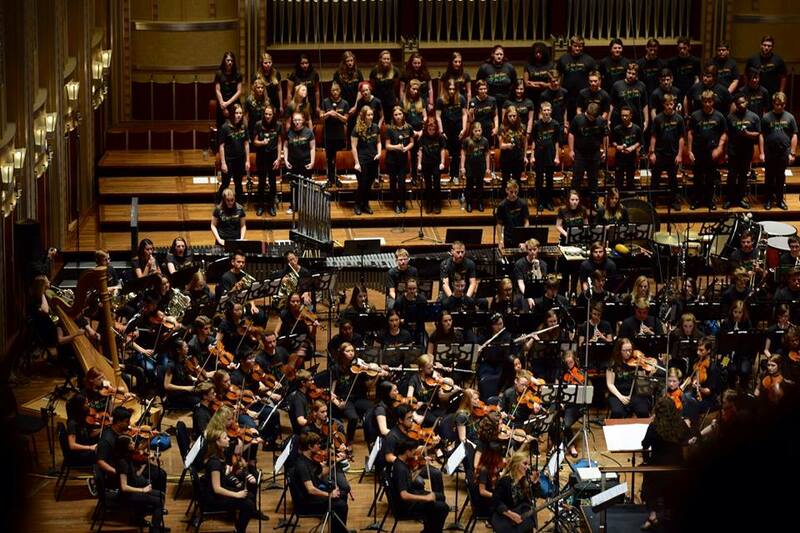 OFHS student Megan Green plays piccolo with the Contemporary Youth Orchestra throughout the year. OFHS student Lexy Jensen and OFMS students Greg Smith, Lainey Rambert, and Alexis Nelan all auditioned and were selected for the CYO Chorus singing group formed specifically for this special concert event. These talented Bulldogs joined outstanding student musicians from across the greater Cleveland area for this exciting event. Students attended multiple rehearsals throughout the month of May, learning a set list comprised of approximately 20 songs from Etheridge’s extensive catalog of music. Melissa Etheridge joined the group for the two final days of rehearsals leading up to the evening concert event at Severance Hall on June 7th. The entire project from start to finish was captured on film for an upcoming “making of” documentary. Congratulations to these talented Bulldogs! CHECK OUT MORE MUSIC NEWS IN THE LATEST ISSUE OF OFMA’S MUSICAL NOTES! The final weeks of the school year are incredibly busy for all of our Bulldog musicians! Olmsted Falls Music Association has just finalized the last Musical Notes newsletter of the year. Please click HERE to view it now. This June/July 2017 issue will also be posted on the OFMA website and OFMA Facebook. Be sure to check it out to stay up on the latest music news from Bulldog Country! 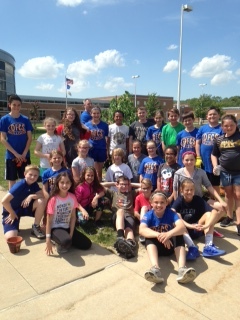 The Olmsted Falls Intermediate School Green Team ended another successful year by planting two new trees outside the school’s library entrance. 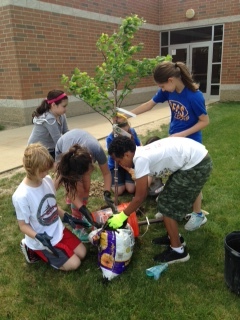 The Green Team members helped plant and water the two trees along with some beautiful decorative bushes. Thanks to our Green Team members for all your help and dedication in making OFIS a ‘green’ school! To view more photos of the tree planting project, please click HERE. Congratulations to the 280 members of the Class of 2017! Parents, family and friends gathered at Cleveland State’s Wolstein Center on the evening of May 25th to celebrate Commencement. 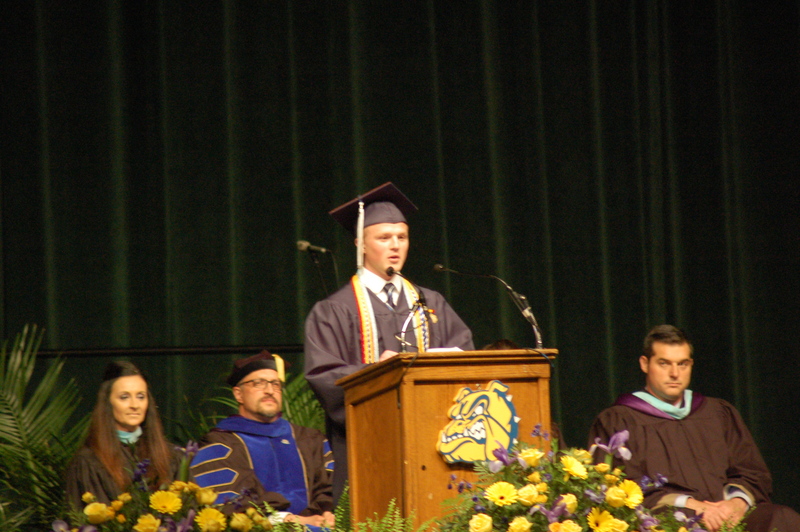 OFHS graduating seniors Casey Komar (Class of 2017 President), Alexander Kho (Phi Beta Kappa) and Stephanie Schroth (Phi Beta Kappa) were featured speakers, along with School Board President Joseph Bertrand and OFCS Superintendent Dr. Jim Lloyd. 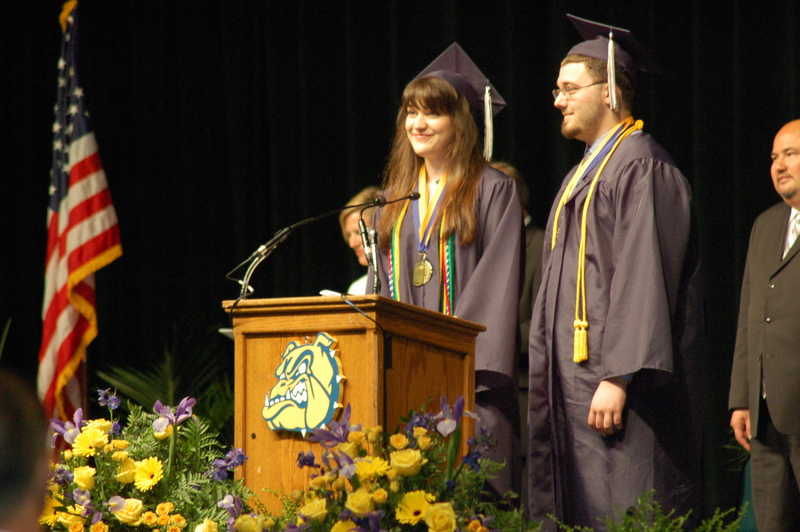 The singing of the OFHS Alma Mater was led by Nadia Bubna and Ryan Miller (pictured at right). To view the entire 2017 Commencement program, click HERE. To view a gallery of photos from the event, please click HERE. For information on ordering official graduation photos from LifeTouch, please see item below. Congratulations again to this year’s Bulldog graduates! Lifetouch National School Studios is offering parents a chance to order photographs of your student at the commencement ceremony. Every student was photographed and photos are available online. There is no obligation to make any purchases. OFHS STUDENTS STANDOUT AT POLARIS! Five Bulldog students earned top honors for their respective programs at Polaris Career Center and were recognized during the 41st Annual Polaris Awards Ceremony held in May. Congratulations to all of these outstanding students! Go Bulldogs! Recipients of 2017 Scholarships presented through the Olmsted Falls Endowment and Alumni Association. Thanks to the generous support of more than 80 local individuals, families, businesses and organizations who contributed to the Olmsted Falls Local Scholarship Program this year, $125,400 in local scholarship funds were awarded to students in the Class of 2017. This year’s total represents an increase of more than $10,000 as compared to last year! More than 260 local scholarships were awarded to graduating seniors this year, thanks to the generosity of our community! Congratulations to all of this year’s scholarship recipients and sincere thanks to this year’s Local Scholarship sponsors. 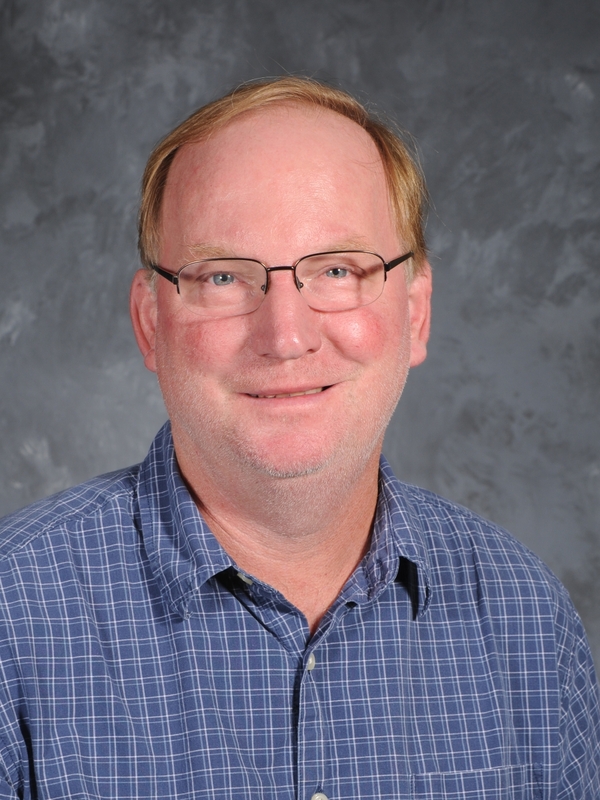 Olmsted Falls School District sincerely appreciates these valuable contributions to our students’ futures. This annual generosity is part of what makes Olmsted Falls a truly special place for students. To view the list of Local Scholarship Awards for the Class of 2017, please click HERE. 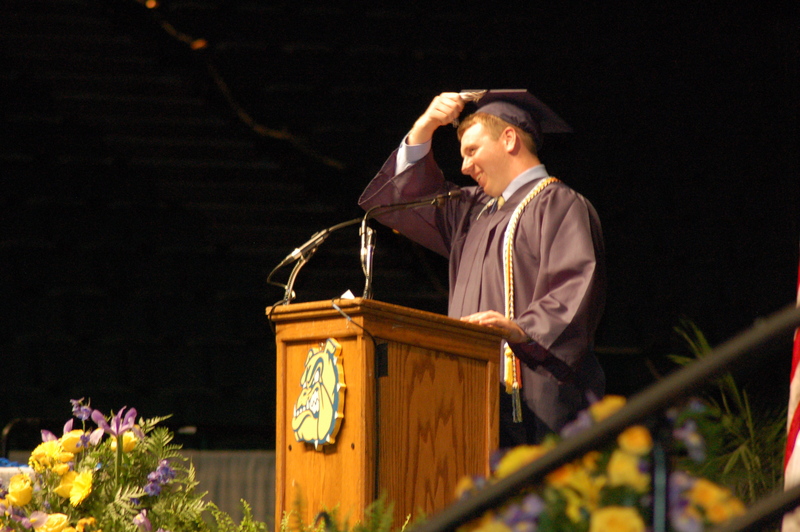 To view more photos from OFHS Senior Honors Day, please click HERE. Students in the Class of 2017 also earned an impressive collection of College/University and other scholarships this year totaling more than $1,302,500. To review a list of students who were awarded College/University and other scholarships this year, please click HERE. Congratulations to all of our scholarship award recipients from the Class of 2017! Best of luck to you all! 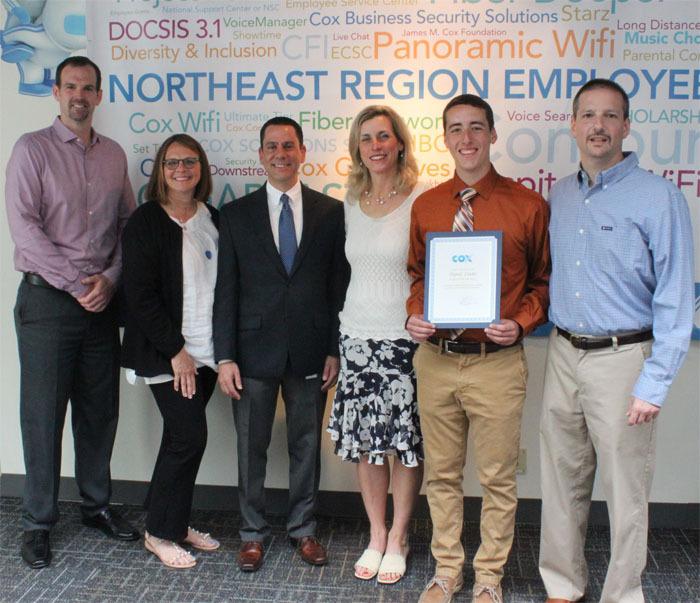 Bulldog 2017 grad Daniel Linder received a $2,000 scholarship from Cox Communications for academic excellence, community involvement and his desire to pursue a degree in communications, telecommunications, technology or engineering. 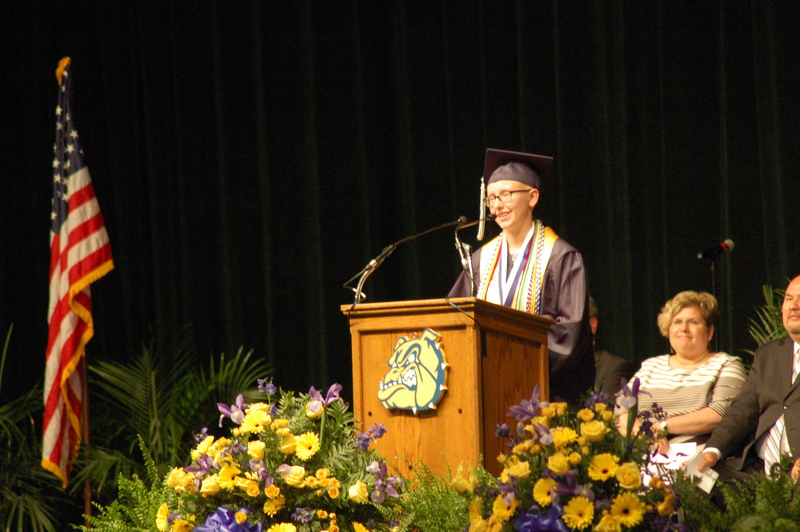 He plans to attend the University of Akron and pursue a degree in data science and technology. Congrats, Daniel. To read a recent article about his scholarship, click HERE. OH, THE PLACES RECENT GRADS WILL STUDY AT NEXT YEAR! Recent Bulldog grads will travel across the state – and country – to attend colleges and universities next year. 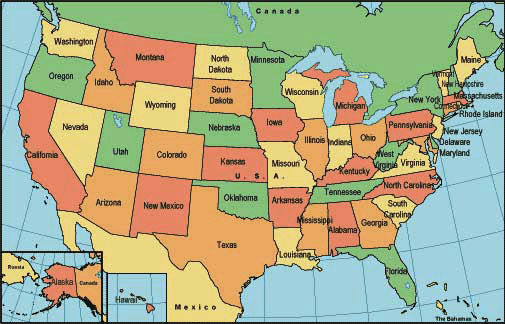 An interactive map may be viewed by clicking HERE to see exactly which colleges/universities they will attend and how many Olmsted Falls High grads will study there beginning this fall. Simple click on each location and a graph will pull down with the data! Students of the OFHS Class of 2017 selected Language Arts Teacher Mrs. Lisa Topolski to receive the annual Teacher of the Year Award at the Senior Honors Day Assembly held May 24th. 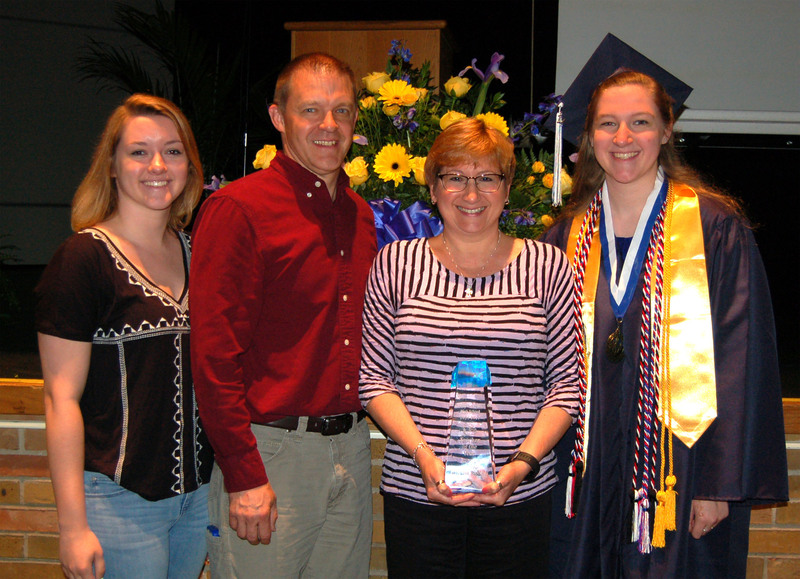 Mrs. Topolski was joined by her family to celebrate this special recognition. 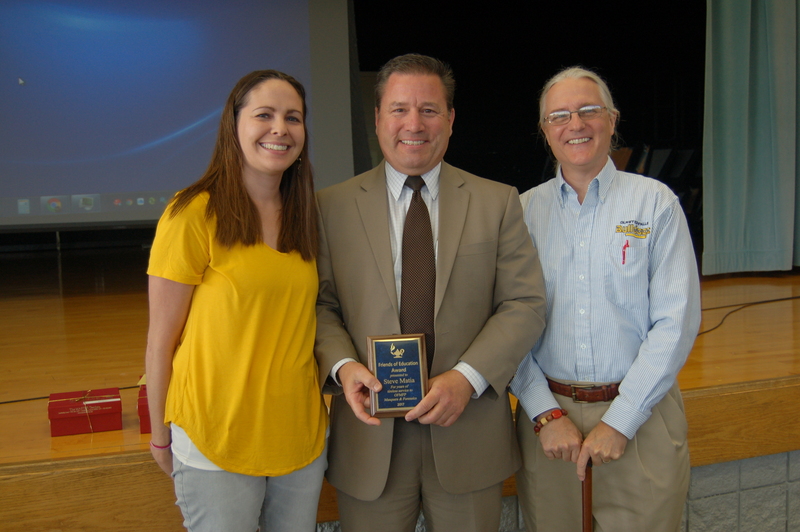 Olmsted Falls High School teachers Jessica Jones and John Mercer presented Bulldog supporter Mr. Steve Matia (center) with this year’s “Friends of Education Award,” which the Olmsted Falls Education Association presents annually. Mr. Matia was recognized for his long-time dedicated support of Olmsted Falls Masquers & Forensics activities. Mr. Matia continues to help behind the scenes even after his youngest student graduated from OFHS! Congratulations and much gratitude to Steve Matia! RETIREES DEDICATE MORE THAN 230 BULLDOG YEARS TO DISTRICT! Congratulations and best wishes to all of our Bulldog retirees this year! Olmsted Falls School District bids farewell to twelve dedicated staff members who retire with the conclusion of the 2016-2017 school year. Their combined service to Olmsted Falls Schools total 232 Bulldog years! Our retirees were recognized by their building/departments as well as at the District’s Annual Records Day Breakfast for staff. 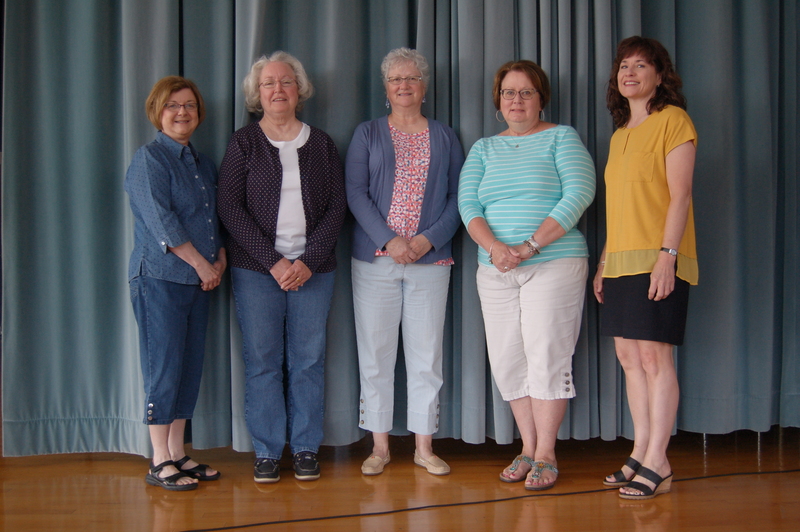 On behalf of the Olmsted Falls Schools and the Olmsted communities, we extend our heartfelt appreciation to each of this year’s retirees for their commitment to the education and well-being of our children. These valuable individuals and their impact on the District will be greatly missed. Congratulations to each of them and best wishes for a happy, healthy retirement! Enjoy the next chapter in your lives! Kiwanis Club member Kris Correll presented this year’s 2017 Employee of the Year Awards. At the close of each school year, staff members are invited to nominate fellow colleagues for the annual Employee of the Year awards. A special committee of local Olmsted Falls Kiwanis Club members reviews these nominations, selects the awardees and presents the awards at the annual end of the year staff breakfast. Kiwanis Club member Kris Correll represented the committee to announce this year’s Employee of the Year awards at the staff breakfast . Thank you to the Kiwanis Club for its continued support of the Olmsted educational community. 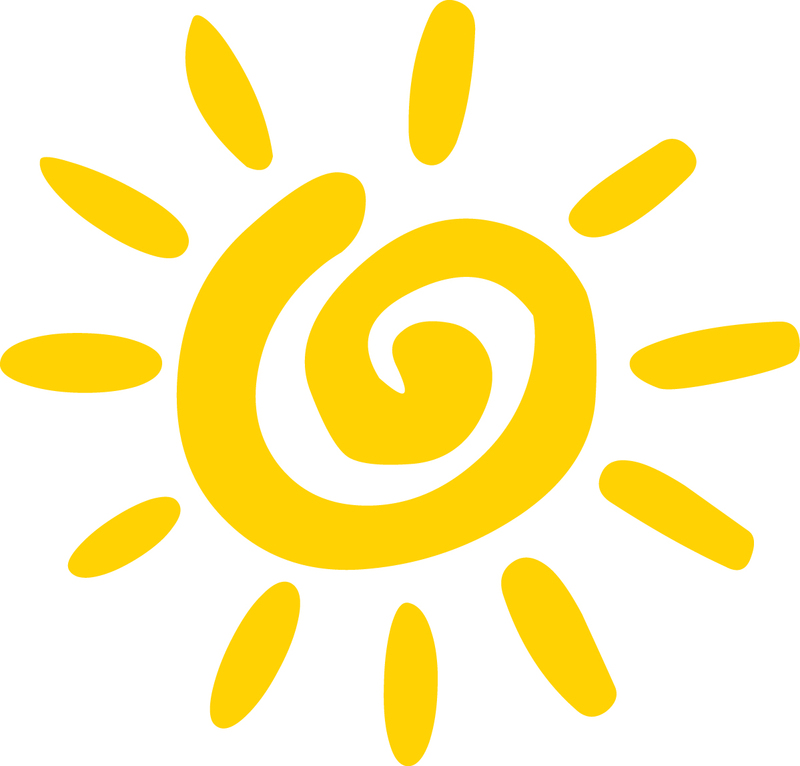 It’s summer vacation and time to fill those long sunny days! Bulldog Summer Sports Camps are here. Please click links below for summer sports camp information available to date. Olmsted Falls Bulldog Football 2017 Summer Camp (Grades 3-9) – June 26th – 28th The Bulldog Summer Football Camp runs from 8-10 a.m. from June 26th-28th for grades 3-6 and 10:30 a.m. to 12:30 p.m. for grades 7-9. Links to additional Bulldog Summer Sports Camps will be added as they becomes available. Watch the blog for updates or visit http://olmstedfallsathletics.net/ and click on the “Camps” link for the latest information. Please don’t forget to register for the Olmsted Falls Bulldog youth football camp! Please click HERE to register on-line at the Olmsted Falls community center. Important dates and information for 7th & 8th grade football players have just been posted on the Olmsted Falls Athletics website. Be sure to check out the site and mark your calendars accordingly! 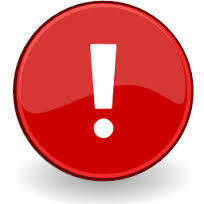 Click HERE now to access this important information on the OF Middle School Football homepage. Neighboring North Olmsted School District received a grant again to sponsor a Summer Breakfast, Lunch & Snack program for children between the ages of 1 and 18 during the summer months. It is FREE to all children ages 1-18. The program runs now through Aug. 18th at various locations school and community locations in North Olmsted. All meals must be consumed on site. To view a detailed flyer with specific locations of the program, click HERE. ATTN: ALL BULLDOG PARENTS! Just a reminder to be on the lookout for the email notification later this summer alerting you to when the portal for returning student registration has officially opened. Once the portal has opened, all student information updates and forms for the upcoming 2017-2018 school year will need to be COMPLETED ONLINE BY THE FIRST DAY OF SCHOOL ON AUGUST 21st. The purpose of this annual update is to verify the information we have on file for your child(ren), allow you the opportunity to make changes if necessary, and submit all required start-of-the-year forms electronically (Emergency Medical Authorization, Acceptable Technology Use Policy, Permission to Photograph, etc.). Like last year, the link to access this online registration system for returning students will be located within your PowerSchool Parent Account, and you will be alerted by email once the link has been activated for the upcoming school year. Here is the list of winners for the OFMS PTA May Calendar Raffle. Please be sure to pick up your prize in the OFMS office THIS WEEK. A huge THANK YOU to everyone who participated! 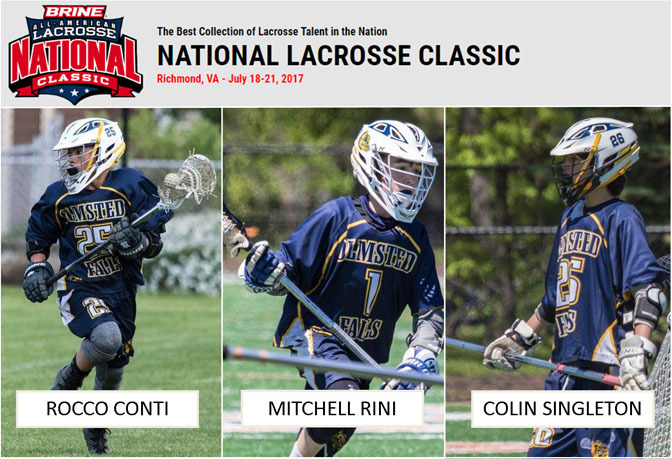 Congratulations to Olmsted Falls sixth graders Rocco Conti, Mitchell Rini and Colin Singleton. These Bulldog lacrosse players were selected to the Brine All-Ohio 2023-2024 team that will play for the Brine National Championship in Virginia July 18-21. Gavin Moore also was selected as an alternative. Best wishes for a great competition! 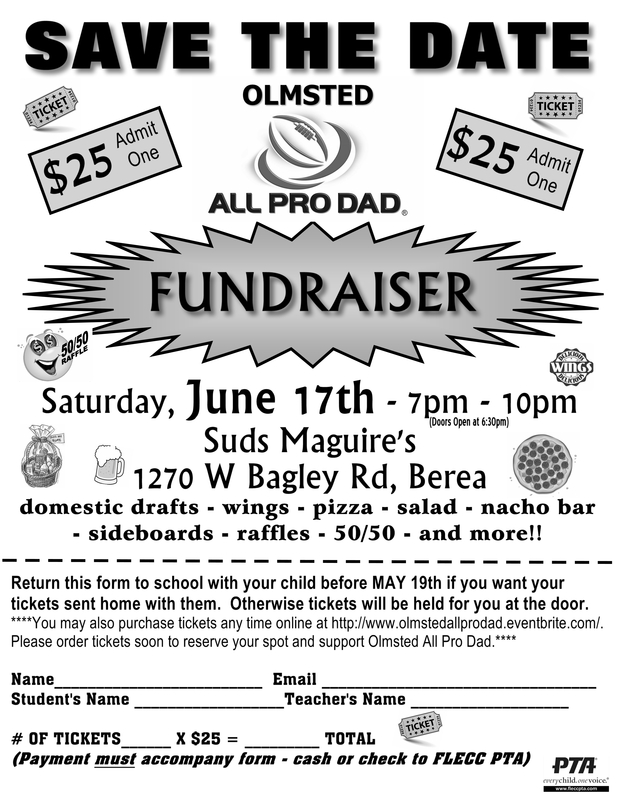 Olmsted All-Pro Dad will host a fundraiser from 7-10 p.m. THIS SATURDAY at Suds Maguire’s, 1270 W. Bagley Road. The fundraiser will raise money to develop awareness of the new group and increase funds for program growth. Tickets are $25 each and include pizza, wings, salad, nacho bar, some beverages as well as sideboards, 50/50, raffles and more. Tickets are now available online at http://www.olmstedallprodad.eventbrite.com. The group is now at Falls-Lenox, with hopes to grow and further establish itself in the community so members can reach more dads and kids in OF schools. 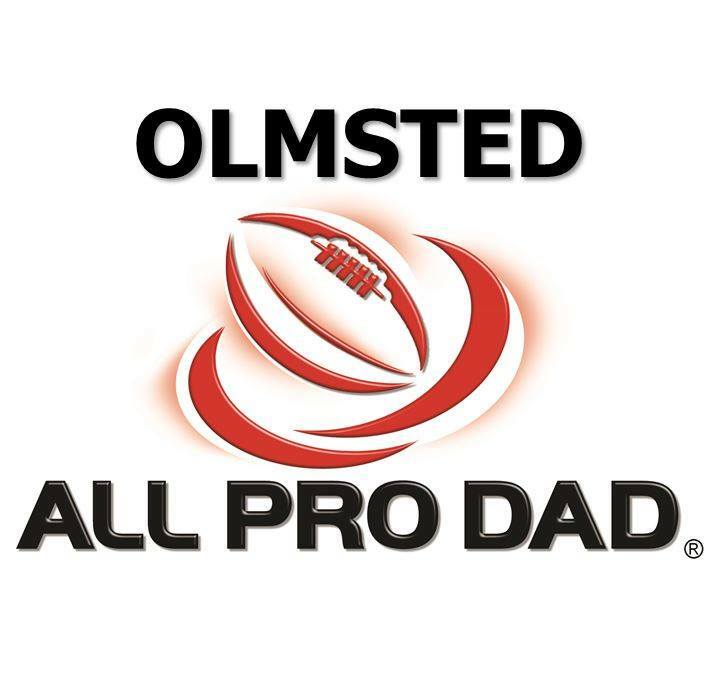 The group’s website is http://www.olmstedallprodad.com. It also has a facebook page by clicking HERE. FORE! OLMSTED FALLS ALUMNI ASSOCIATION GOLF OUTING – JULY 29TH! It’s getting closer! Get your foursome together for the 22nd annual John Sanders Memorial Golf Outing on Saturday, July 29th. You do not need to be Alumni to attend ~ all golfers and wanna be golfers are welcome. $85 per golfer includes 18 holes, riding cart, lunch, beverages, dinner and golf favor. 8:30am shotgun start. The Bulldog Flag Football, which the city of Olmsted Falls sponsors, is a recreational and fun positive league that now has open registration through June 30th. The league is an educational experience open to boys and girls in grades Kindergarten through 6. To view a detailed flier and registration form, click HERE. Kids entering Kindergarten through grade 6 are invited to participate in the Bulldog Summer Art Camp through Olmsted Recreation at Pinot’s Palette, 8051 Columbia Road. The camp covers 10 one-hour classes over two weeks from Monday, July 10 through Friday, July 22. It is $50 a student for Olmsted Falls residents and $55 for non-residents. There are morning sessions divided by age. To view a flier and registration form, click HERE. Have questions? Please call Joelle McNea, Olmsted Recreation coordinator, 440-427-2519, with any questions.